Leeds three-piece Drahla are an anomaly: brazenly committed to doing things their own way, the band’s sound is somewhat at odds with the current musical landscape, negating layered, fuzz-pedal driven psychedelia in favour of a kind of innovative post-punk that draws from the parentage of Wire and The Fall in their prime, in part thanks to a propensity for enormous hooks and potent bass-lines, but mainly because of an ability to subvert conventions and take it somewhere new. You only have to look to recent single ‘Silk Spirit’ to gauge the strength of their conviction: the collision between desolate, minimal punk and melody is strange but curiously alluring. It’s been noted a few times that the riff in that song occasionally sounds very similar to Wire’s ‘The 15th’: “It wasn’t intentional. We’re big fans of that band so I guess their influence subconsciously filters in. Funny you say that because 154 is probably the one album I have listened to the least” says bassist Robb Riggs. Singer and guitarist Luciel Brown agrees that Wire have been hugely influential in terms of their approach to song-craft: “Wire were definitely a catalyst for us starting the band and the direction we took. I think the main influence with them is their energy and approach to writing, breaking standard structures and familiarity” she explains. “Our musical interests and influences are constantly mutating, at the minute we’ve been listening to a lot of Joe Henderson. The No Wave movement in the late 70’s in New York is also pretty influential” says Robb. The three-piece are not simply post-punk paradigms, however: as a review on Norman Records observed, they stand aside from most of today’s indie acts by “having their own sound and not simply coming up with a facsimile of something that’s already occured.” Despite there being obvious influences, Drahla don’t really sound like much else around at the moment, which is less of a conscious thing and more of a sign that the band are just doing what comes naturally to them: “To be honest, I wouldn’t know what the current trend is” says drummer Mikey Ainsley. Rob elaborates: “I think following trends is a real cheap and lazy way of creating and it becomes sterile so quickly. Originality is a rare thing these days and the process of trying to achieve that is so much more rewarding and stimulating”. The most striking quality of Drahla’s music is Luciel’s aptitude for creating lyrics that are both cryptic and playful, with a lot more going on than the usual discourse of love and loss: “I’ve always been interested in writing and wordplay. Often I’ll have a batch of stuff that’ll get chopped and changed around and used for lyrics. Religion comes up time again. I went to a Catholic primary and high school which gave me an incite into Catholicism to question, so naturally that’s always a theme” she explains. Drahla formed instantly after moving out of London back to Leeds: “the band was born out of feeling isolated and discontent with living in London” explains Lou. 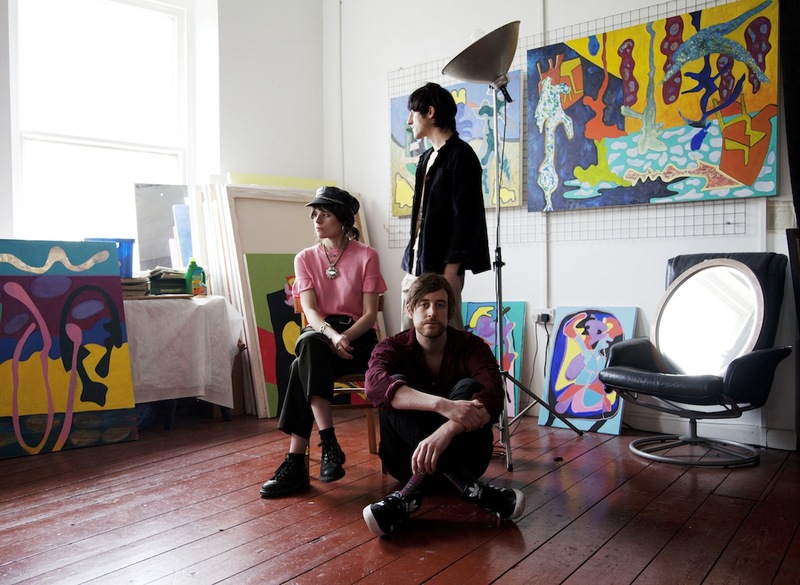 At first, Drahla thought Leeds’ DIY scene felt insular and weren’t sure where they would fit. Now, after playing more shows, the band feel right at home: “We’ve met some really great people and bands. There’s a sense of inclusivity and community in Leeds that’s good to be part of” explains Luciel. Drahla are currently writing and recording material which will be the bones for their next release. Excitingly, they’ve been recording with XAM Duo / Virginia Wing’s Chris Duffin, and we’ve been told to “expect more sax” when the album does eventually arrive. Next for Drahla is a tour in April with Ought, with a couple of shows lines up in France in March. They’ll also be doing a run of dates in June. There’s a sense that this band are going to go on to bigger things, but in terms of now, they remain a shining presence in Leeds’ music scene - a scene which, for as long as I can remember, has always prided itself on embracing variety and difference, instead of being known for any particular sound or style. There’s no better home for a band that defy conventions as fiercely as Drahla do.